While we haven’t had the opportunity to take a look at the 380X ourselves yet, early reviews show it beating out NVIDIA’s GTX 960 by up to 25%, while trailing the higher priced GTX 970 by as much as 30%. Which makes it a smack in the middle option for users who are looking for a bit more performance than the GTX 960 offers, but don’t want to shell out over $300 for a GTX 970 or R9 390. This is great news, as the R9 380X launches at a price-point of $229 for reference models, while custom variants will be priced as high as $250. Specifications for the card are also smack in the middle, as to be expected. It features a full Antigua XT (Tonga XT) GPU core, which is of course based on the Antigua/Tonga Pro core found in the Radeon R9 285, and R9 380. The Radeon R9 380X packs 32 compute units with 64 stream processors on each. This brings the total number of cores to 2048, which is a rougly 14% increase from the R9 380’s 1792. It also features 128 TMUs, and 32 ROPs. 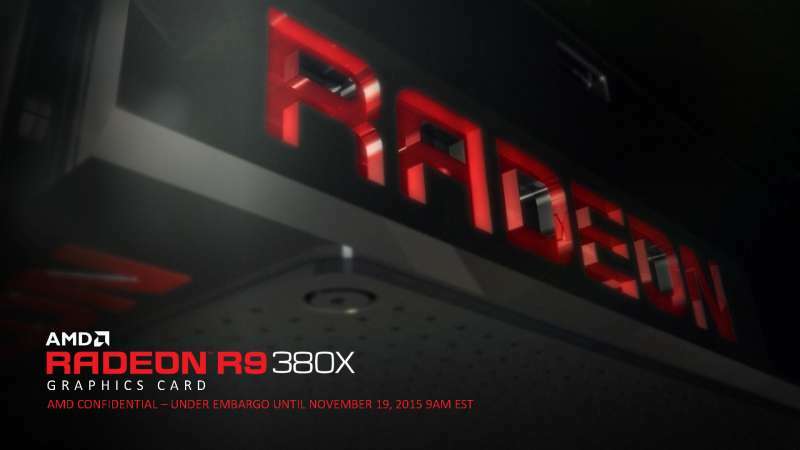 The Radeon R9 380X packs clock speeds of 970 MHz base clock with up to 1000 MHz boost clock. The card features 4 GB of GDDR5 memory which is paired with a 256-bit bus interface as well as a memory clock of 5.7 GHz that allows for up to 182.4 GB/s of memory bandwidth. However, overclocked models are expected to increase those figures substantially with core clocks exceeding the 1GHz mark, and memory clocks up to 6.0GHz. 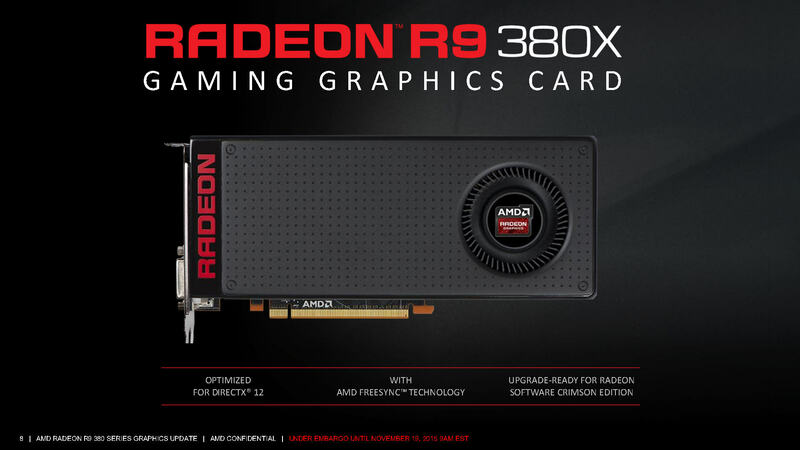 The card is based on GCN 1.2 revision just as AMD’s Fiji based R9 Fury cards. It features support and optimizations for DirectX 12, and Async Compute. It also has support for Vulkan, the Khronos Group’s next-generation successor to OpenGL. It also of course, features support for AMD’s CrossFireX, with scaling up to 4 cards. In addition to AMD’s FreeSync, EyeFinity, VSR, and Liquid VR display technologies. 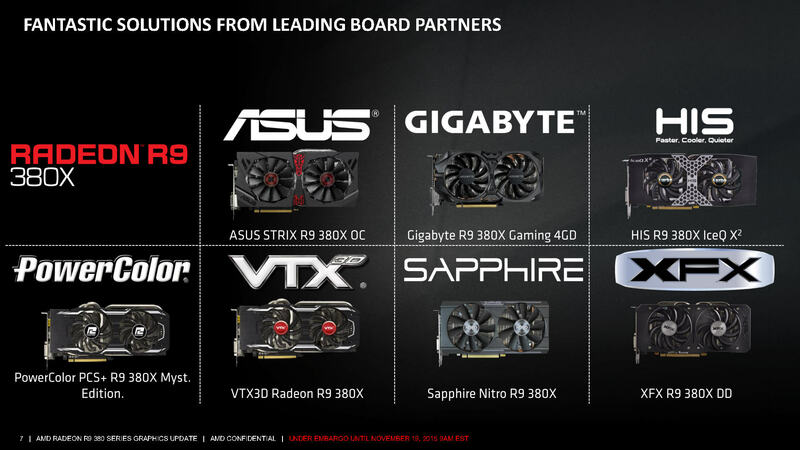 The R9 380X will be available soon at a number of retailers, and online stores, with models available from many of AMD’s board partners, including XFX, Saphire, ASUS, GIGABYTE, and PowerColor.